As athletes, we train, eat well, pay attention to sleep and recovery, set goals and—hopefully—achieve the majority of those. We also tend to inspire others. Our neighbors see us coming back from a run at 6:30 AM; or, going out for a long bike ride on a hot, summer day. They shake their heads in amazement—oftentimes wonder—but, in some cases, we "mortal" athletes do inspire and motivate others toward a more healthy lifestyle. I'm not sure doing what it takes to win multiple Ironman World Championships, or setting the record for running to the top of the famed mountain, Mont Blanc, would inspire an otherwise sedentary individual; however, I can guarantee that if you fall in the former category—an athlete who sets goals, trains, and lives a lifestyle focused on achievement, here are three books which will undoubtedly inspire you in vastly different ways. During her relatively short triathlon career (2006-2011), Chrissie Wellington won four Ironman World Championships, as well as setting numerous Ironman world records. She was virtually—and literally—unbeatable. It is not until about one-third of the way into A Life Without Limits—A World Champion's Journey, though, that we even begin to hear about triathlon. And, thus, the first lesson about Chrissie: her depth as a person goes way beyond triathlon. Yes, the book chronicles her triathlon career from newbie to world champion in two years; and, yes, there are many great stories, lessons and tips for all triathletes within the pages. 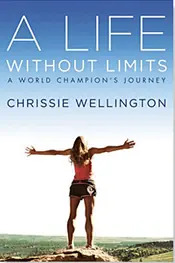 However, the essence of the book is, as I have said for three or four years now, Chrissie Wellington has a far greater purpose on earth than triathlon. As she told me, "I would say my life has been dominated by two dynamics: an obsessive lust for control and self-improvement on one hand, and concern for people and their situations on the other." It is the latter that I so love about Chrissie—her work and travels throughout Asia, her work as a civil servant in the field of environmental sustainability, and her unrelenting drive and efforts to help others in third-world countries. Even now, post-triathlon career and book writing, arguably the greatest Ironman triathlete ever continues her focus on helping others, and advancing important causes. For those mainly interested in a "triathlon story," and what made Chrissie the amazing athlete she became, you will not be disappointed. We get an "unabridged" look at her tumultuous, though hugely successful, relationship with Brett Sutton, her first—and highly controversial—coach. We get a glimpse of some of the Champion's training techniques, her mental strengths, and living and training in Boulder. We learn of the eating disorder Chrissie battled early on in her life, and we race with her on the Queen K in Hawaii, as well as when she sets records in places like Roth, Germany. And in the book's final two chapters, we really see what Chrissie Wellington stands for. "The Heroes of Ironman" tells the stories of eight triathletes who "...are just a few of my guiding lights. whose stories serve as the most moving tribute to the sport of Ironman I can think of." People like Sister Madonna Buder, the ever-inspiring 80 year-old "Iron Nun;" Jon Blais, the "ALS Warrior Poet," who completed the Ironman as he was facing the reality of dying from ALS; and, Scott Rigsby, the first double-leg amputee to complete an Ironman. And, finally, we better understand what it took for Chrissie to win that final Ironman World Championship in 2011, after suffering a major bike crash just weeks before the big day. We learn just how badly hurt she was from the crash, how she was in the hospital for six hours just days before the race, and the pain and suffering she endured as she raced what was one of the gutsiest endurance efforts ever done on the lava fields—or elsewhere—in the sport of triathlon. When asked how Chrissie Wellington should best be thought of, she told me: "For my passion, my love for what I do, and for giving people the inspiration to succeed in triathlon and life. And, of course, to do it with a smile." This book does a terrific job of getting to know, understand, and appreciate the greatness of this World Champion as an athlete; and, more important, as a person.